Seasons after Fall is a bit of a departure from developer Swing Swing Submarine’s past works. Where Blocks That Matter and Tetrobot and Co. thrived on complex puzzle solving, Seasons after Fall is a much more laid back affair. It’s less interested in challenge as it is in telling a charming story, in letting you loose in its wonderful hand-painted world. It does have puzzles, and they certainly entertain, but it’s the simple pleasures of exploration that make Seasons after Fall shine. You assume the role of a fox – or rather, a spirit who’s possessing said fox. You emerge from the ground and arrive in a clearing amidst a forest. Stones lay in a rather particular arrangement and tree branches stretch upward twisting into spiral patterns. It gives off a very ornate feeling. Before you have much of a chance to take it all in, however, a voice calls out to you. “Ah, there you are,” it says. You’re told that you’re a seed, which apparently means you need to gather the powers of the four seasons to perform the ritual of seasons to do… something. They’re not very forthcoming. All you need to know is that it is important. From there you head out to the farthest corners of the forest in search of the four guardians of the seasons, so that they may grant you the ability to harness each season’s power. Before you can change seasons on the fly, Seasons after Fall assumes a very a simple, relaxing mood. You can only run, jump, and bark as the fox, your interactions limited to what few plants you can use in summer (the season the game begins in) to create paths. Seasons after Fall is purely an exploration game in its early goings, only hinting at the presence of puzzles throughout its first half. Clearing hollowed tree trunks, planting mushrooms to create platforms, and creating snowballs that act as stepping stones make up the majority of the game’s obstacles. That sort of light problem solving ensures Seasons after Fall maintains its peaceful tone. As you complete each of the game’s four zones, however, it becomes increasingly clear that you’re not being told the whole story. Vines keep rising from the ground, locking you out from revisiting the domains of the four guardians, who all seem to be in a permanent state of slumber. Your disembodied voice of a guide doesn’t seem very concerned about all that, though, never acknowledging any of these oddities. What’s actually going on is that your new friend has unwittingly destabilized the nature of this particular forest. The winds of each season have been sealed away and the guardians weakened, leaving them mostly powerless to fix things. Thus the responsibility to set things right falls to you. The overall story feels like something from a storybook. It’s very gentle in how it’s told, extolling the virtues of patience and respect for all living things, as well as lightly touching on things like anxiety and abandonment. It’s not a particularly complex or stirring tale, but it is a charming and enjoyable one all the same. The shift in objectives marks the point where the game fully takes shape. The minute-to-minute action doesn’t change much – you’re still running about beautiful hand-painted landscapes, occasionally changing seasons to bypass obstacles – but with the ability to change seasons at will and all the areas unlocked for you to explore at your leisure in whatever order you choose, Seasons after Fall hits its stride. Prancing through familiar ground, exploring previously inaccessible nooks and crannies, seeing how the colors of each zone change depending on the season makes revisiting old areas just as enjoyable as they were on your first visit. The second half also throws some actual puzzles into the mix, but nothing that disrupts the game’s easy-going nature. Each of the puzzles involves activating stones covered in thorny vines. The means of powering each one up differ between zones. In one instance you’re drawing symbols using fireflies, while in another you’re navigating an underground tunnel network clearing debris to restore the airflow. They’re not terribly difficult to figure out, but they’re just challenging enough to be satisfying to solve. In some ways, it’s a shame Seasons after Fall didn’t really show its puzzle prowess until the end, as there are some fun ones. But at the same time, that never felt like the core of the game. It was always at its best when I was just running about exploring each area to its fullest, enjoying the sights and how they change across seasons. It’s what makes Seasons after Fall so peaceful and comforting, the very qualities that make the game so pleasant to play. 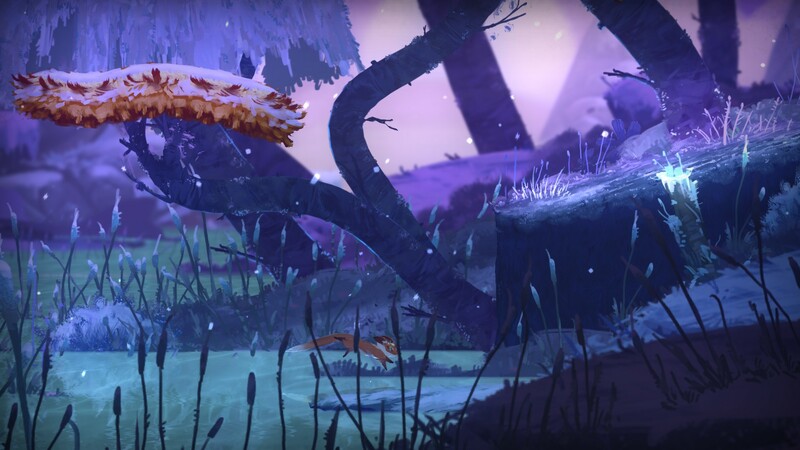 Seasons after Fall may promote itself as a puzzle platformer, but the exploration is its strongest asset, and the game is all the better for it.